Except Integrated Sustainability | The Future of Air travel - How will we fly in 2050? 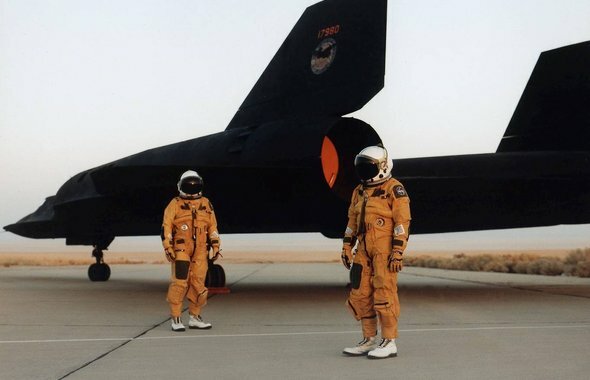 Article > How will we fly in 2050? The last big turning point in aviation was the invention of the jet engine. It being smaller, lighter, much more efficient, made travelling by air economically interesting. This enabled a huge increase in speed, range and safety combined with a huge saving in costs. Travelling by air is now the only option for intercontinental distances, crushing all competition like ocean liners and airships. Aircraft also became a strong competitor in short haul travel with the appearance of low-cost carriers. It seems that the development of the gas turbine is at an end, increases in engine efficiency are smaller, will come less frequent and cost more in development money. The big advantage of a gas-turbine is that is can run on almost any fuel, as long as it is flammable. From natural gas to thick oils that are common in shipping. Only the burners have to be adjusted. Flexibility, compactness and high power make it a versatile and modern heat engine. Why then is it at the end of development in air travel. The strongest combination is a compact power-plant with a fuel with a high energy density. Aircraft fuel is a highly refined fuel that only needs a small combustion chamber. Every alternative at the moment has a lower energy density and would lead to an increase in fuel weight on board. And then is there the problem of the amount of oil available on earth, This will run out and dramatically increase the prices of fuel. When an alternative would become economically viable compared to fossil fuel, flying will be to expensive to do anyway. Margins in the air travel systems are so small that already a small increase in fuel prices eliminate profits. The economic lifespan of an aircraft is about 30 years, which means that an aircraft introduced today is still flying in 2040. It is interesting what the industry looks like after that. The generation of aircraft after 2050 have to deal with reduced fuel reserves and provide answers to the environmental problems connected to the current system. Apart from emissions of CO2 and NOx aircraft also introduce aerodynamic disturbance, water vapour and small fragments of soot and metal in a very sensitive part of the atmosphere. This causes clouds to form earlier then natural and so changing the local climate. The effects on a larger scale are still not entirely understood, but an improvement is required. This shows that the current aircraft industry is highly unsustainable, both from an environmental and an economic point of view. One can see that as it is, we’re approaching a dead end in development of aircraft and air travel, the way we are going now. We have to go back and change course, rethink the whole industry and redefine air travel as a whole. Not being able to go anywhere in a reasonable amount of time is not an option either in this day and age. To explore the outlook for air travel I wanted to look at what the industry would look like after the next generation of aircraft. As with most solutions for sustainability in the future, the best bet is not to put all eggs in one basket. Specific parts of the industry call for different solutions and technologies are more likely to succeed in one area rather then another. A development that is already started is electric flight. An electric motor has the obvious advantage of being both compact and simple, with only one moving shaft, on which the propeller is bolted directly. This is a great solution for the general aviation market. Power is provided by a battery and small air-planes with a range of 200 km are already available on the market. Double that distance and it is the only smart choice. Using the wings as solar panels would be another simple way to increase range. With only 50% of the power provided by PV, the range is doubled. The best suited PV-panels are foil with a structural capacity and a high efficiency. What limits in size and range will be of electronic flight is dependant on the development in electric motors (more power, less weight), aerodynamics (e.g. Flying wings with fly-by-wire) battery and PV technology. Increase in speed seems unlikely, because of the limitations of propellers. Alternatives to jet powered air-planes will need a heat source that is comparable with a combustion chamber burning fuel. It has been tried once (actually twice, but only the Russians were courageous enough to fly with it), but a nuclear reactor can provide the heat necessary to power a jet without combustion. Although safe systems are to heavy to leave the ground, and aircraft that do will kill the crew and spew out radioactive waste. Moving towards an alternative combustible fuel will have to be in combination with a huge increase in aerodynamic efficiency and weight saving, to counter the increased fuel load and cost. 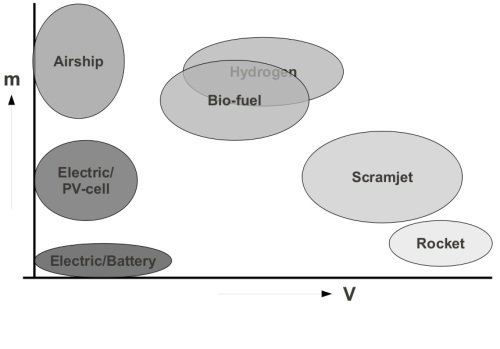 Not wanting to get into the jungle of problems connected with bio-fuels, I’ll summarize the conditions for hydrogen powered flight. Hydrogen has a higher energy density per weight then any other fuel, but it doesn’t come in a handy, safe to handle liquid form. So fuel storage is a problem. Big tanks are heavy and do not loose weight during flight, as a normal fuel tank would, when fuel weight gets lower. This can be solved in four ways. Either counter the tank’s weight with saving elsewhere and use a classic aircraft form or move to a different form. Rockets also use hydrogen but big tanks are not a problem, because they are only used very shortly. All fuel of a rocket for low earth orbit is used in eight minutes. Then the tank is dropped and reused. The other advantage is that there is little or no emissions in sensitive areas or anywhere after 8 minutes of travel. A solution to the hydrogen storage problem used in rocket science is to use hydrazine (H4N2), a liquid at room temperature, as a source for hydrogen. The only problem there is that it is explosive in pure form, highly flammable and very toxic. Even more efficient then a rocket is a scram-jet engine. This type of engine does not have any moving parts, uses oxygen from the atmosphere, so no need to bring it on board and uses the aerodynamic compression of the air-plane as only compression source, burning fuel in combustion chamber at supersonic speed. Hydrogen is the ideal fuel for this type of engine. An aircraft using this engine can skip on top of the atmosphere, only firing the engine shortly every jump. At Mach 10 (10 times the speed of sound) every place on earth is within a two hour travel. Long before we can jump in one and only have time for the paper on our trip to Australia, the Americans use this engine on a bomb that can replace all long range bombers and unreliable allies overseas. Maybe it seems that the future is grim for air travel, but I’m sure that also in the future we will have the same possibilities when it comes to mobility as today. It’s only the question what it will look like. I’m very curious to see that. But it will require some imagination from the big aircraft manufacturers and some risk taking. And maybe James May is right and is the next big thing thought up by a man in a shed, just like the jet engine. Relation between payload and speed of different air travel options.